The creepy detail in Melania Trump's White House Christmas decorations. The uncomfortable detail in Melania Trump's White House Christmas decorations. Melania Trump has unveiled this year’s White House Christmas decorations and naturally, the internet has noticed something… odd. 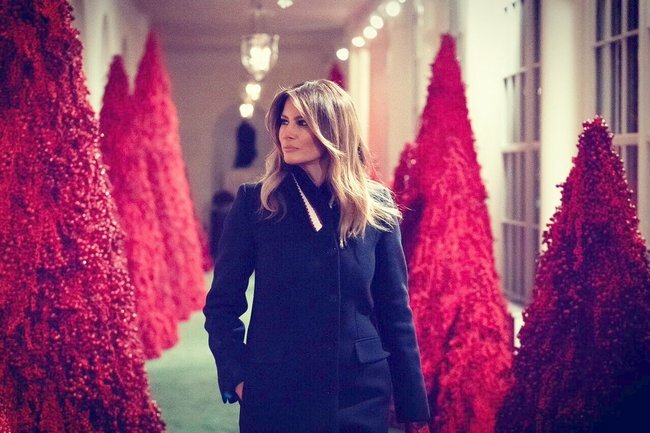 The First Lady has reportedly been working on this year’s decorations since August, but it only took Twitter a couple of hours to point out the likeness of her red tress to handmaids from The Handmaids Tale. This year’s theme is “American Treasures” (which was not a reference to Elisabeth Moss, apparently). “This is a joyous time of year when we decorate the White House for the Christmas season. Our theme honours the heart and spirit of the American people,” FLOTUS said in a statement. This year’s display features 14,000 red ornaments in the White House’s Grand Foyer and Cross Hall and 40 crimson trees in the East Colonnade. WHAT DOES ALL THE RED MEAN? Twitter had other thoughts about of Donald Melania’s decorating. The Christmas special nobody wanted. Thankfully, the hall of handmaids is not the only decorated room. There is also the Green Room, which is decorated to represent the USA’s “bounty and harvest” and the Blue Room, which has the White House’s 5.5 metre Christmas tree. The White House will be visited by 30,000 people as part of public tours over the Christmas period.